My quilt is titled 'V voom' in response to the Vivaldi music set by Martha in this first challenge. It is not so easy to make the intangible visible, but I chose to give form to my response through colour, line and shape. 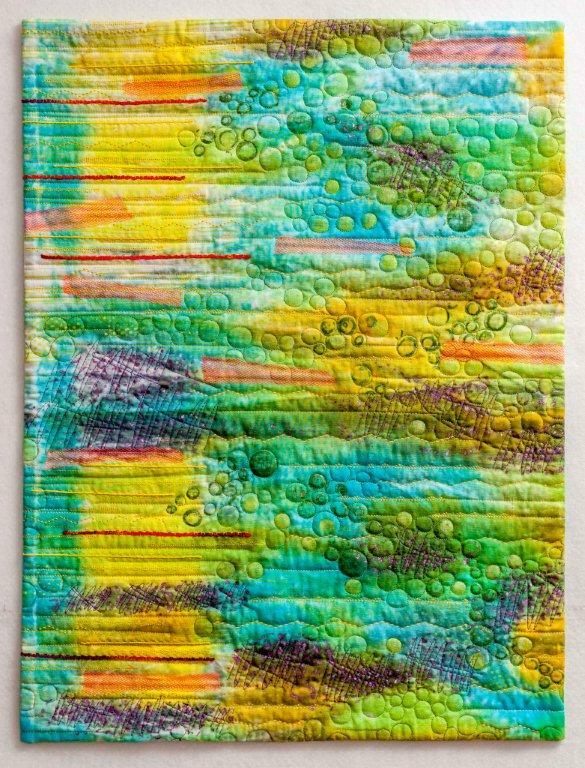 The whole cloth background is a dye painted piece, then enhanced with oil stick rubbings [purple sections and green circles]. I first listen to the music with my eyes shut and saw green. When I listened again and drew my response I had a lot of scribbly lines, circles and a tangled mess! The pace of the music is vibrant, energetic, lively and frenetic with dark passages and restful moments. 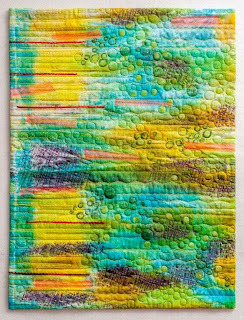 I enjoyed using a few of the pre-programmed stitches on my Bernina 440 and couching threads. 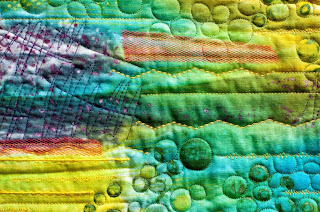 The machine quilting is an integral part of the story in this quilt. I enjoyed the challenge once I put aside my fears about "will it be good enough?". Love it! I can see the music running through this piece. The repetition of lines and circles really captures the pace of the music. Well done, Sue! I love the energy of your piece Sue! No worries about "good enough", you did a great job! Thanks for your positive comments Kate and Lisa-Marie. The fear factor was inhibiting at first, but I enjoyed and love my quilt. Love the vibrant colours in your quilt Sue. Thought it 'spoke' of the music's pace. Looking forward to seeing all the quilts unveiled. wow Sue it looks JUST like the music- great job! Wonderful! Color, repetitions..bright and uplifting. Well done! I concur! The color and bright feel of the piece brings summer to mind, and the repitition of the theme truly captures the music. Love it!